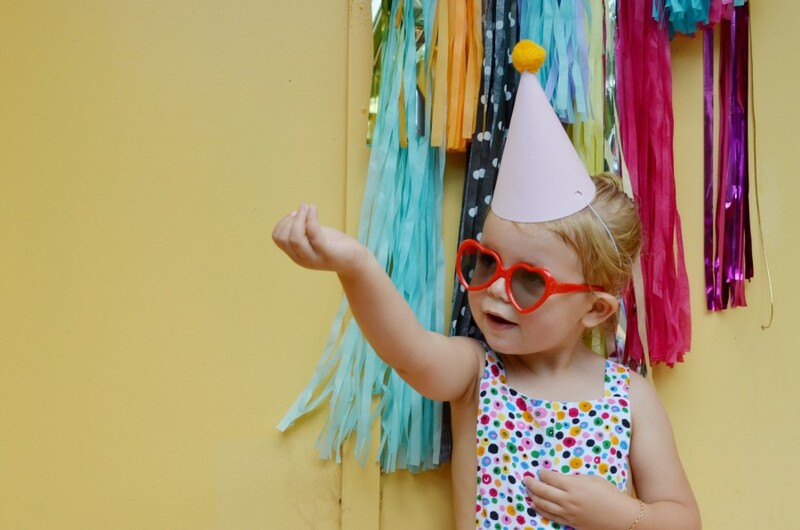 EMILY’S FIRST SPRINKLED BIRTHDAY PARTY. 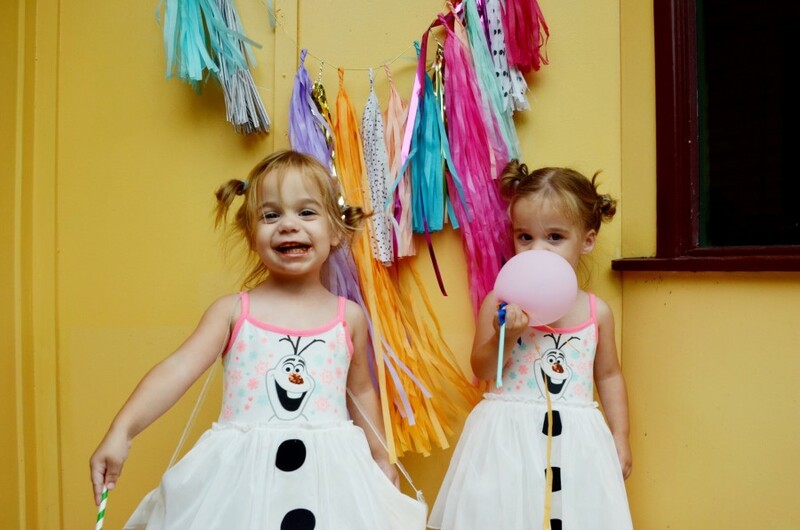 After months and months (or weeks lol) of planning for Emily’s first birthday party, the big day finally arrived. 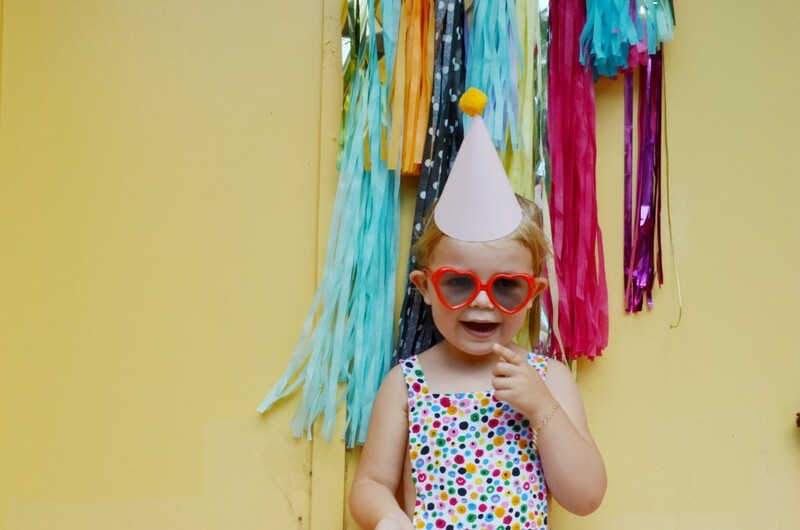 Choosing her birthday theme was a tricky one. Emily doesn’t really like any particular characters so we came down to her love for food, anything colourful from fruit to fairy bread. I was thinking about what food I should serve at the party and I couldn’t help but reminisce my childhood. 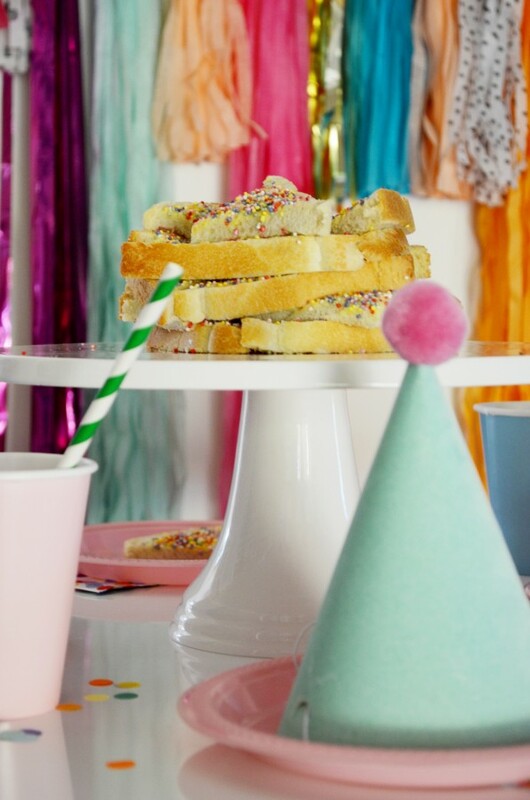 I remember like it was yesterday when we would jump out of our skin when fairy bread was served. 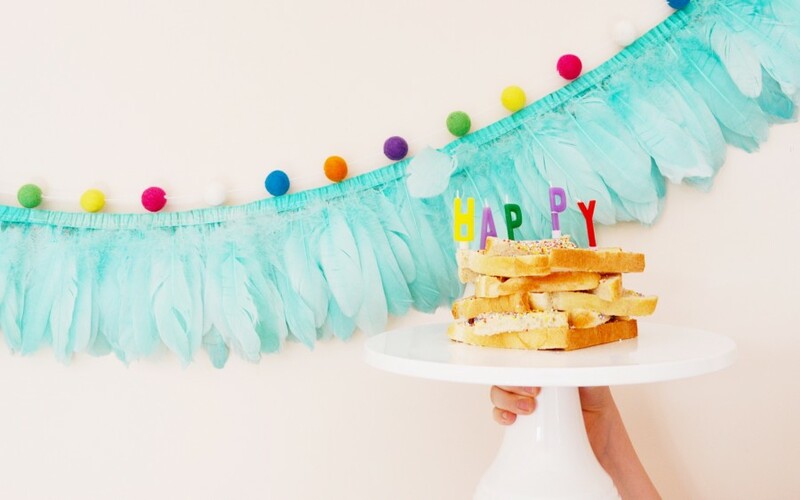 Fresh white bread, butter and colourful sugary sprinkles. But that’s the MAGIC. Three ingredients, good when eaten separately, are actually HEAVEN when mixed together. 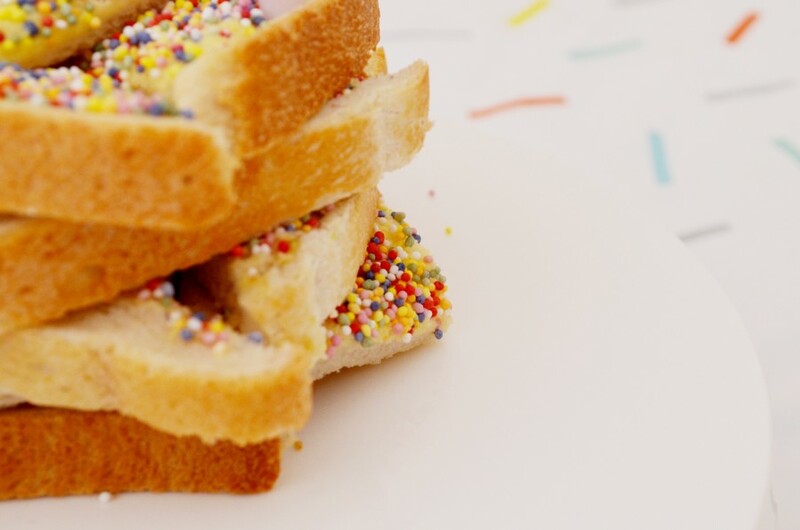 (For my international readers, that are unaware of fairy bread.. Try it and let me know what your thoughts!). 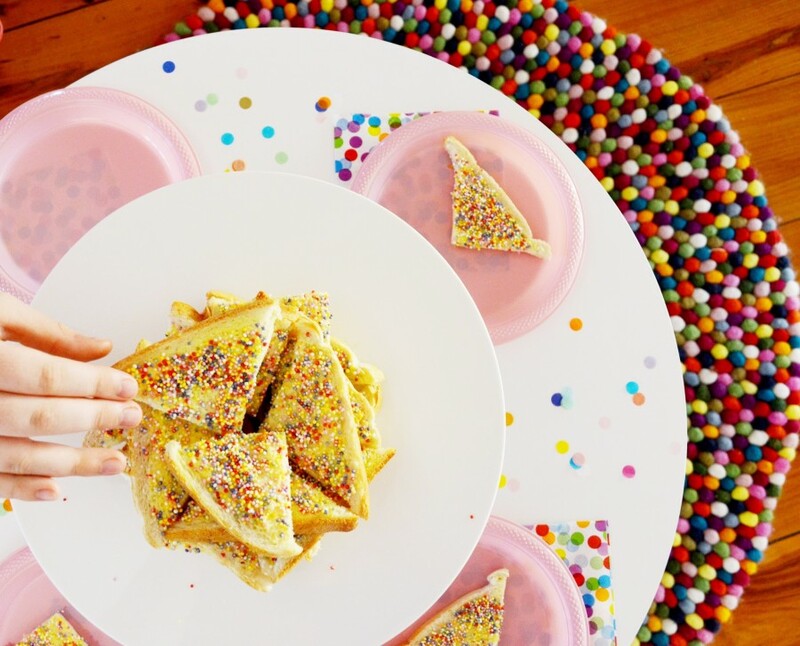 I love how fairy bread has been passed on into our generation and I hope my girls will carry it on. It’s pretty funny watching Emily lick her lips for the left over sprinkles. The pure joy of something so simple! 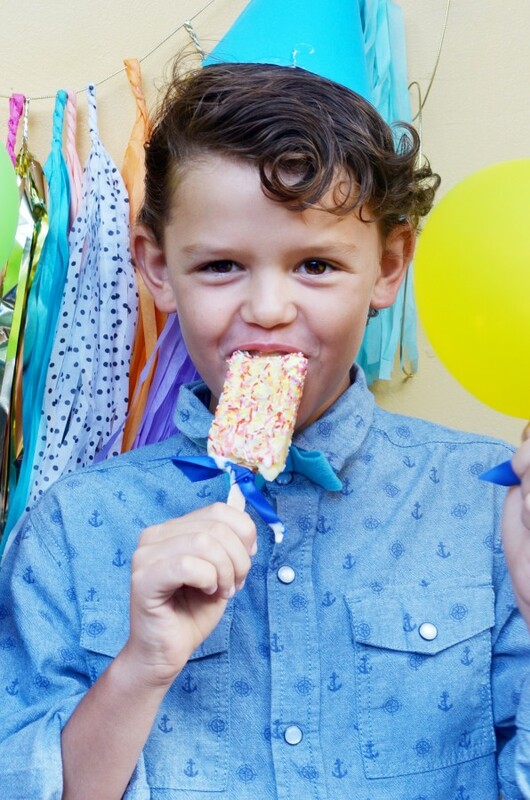 I was SO excited when I saw that Bulla started making Fairy Bread ice cream. Say what?! 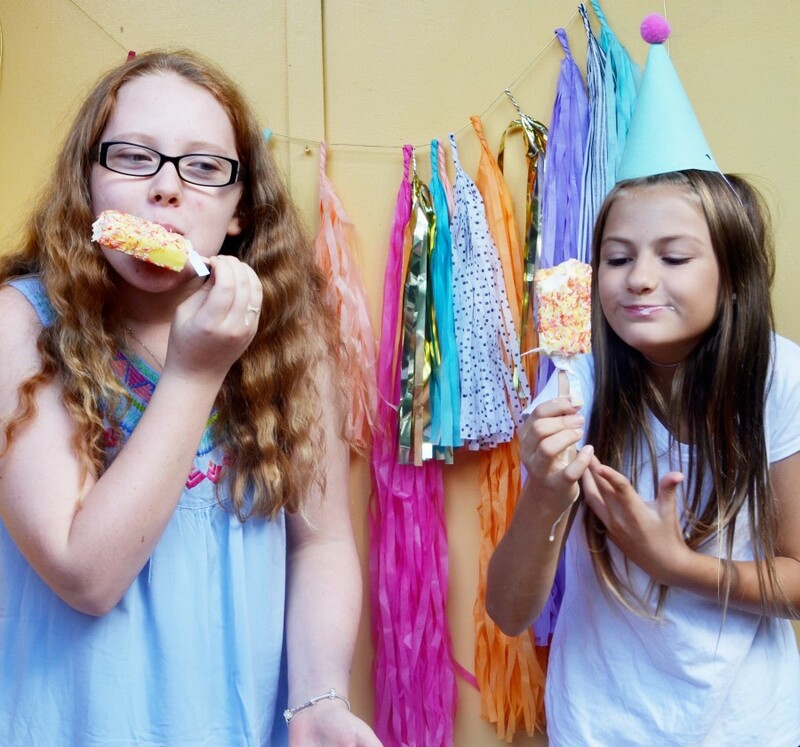 I’ll say it again… Fairy Bread ice cream!! 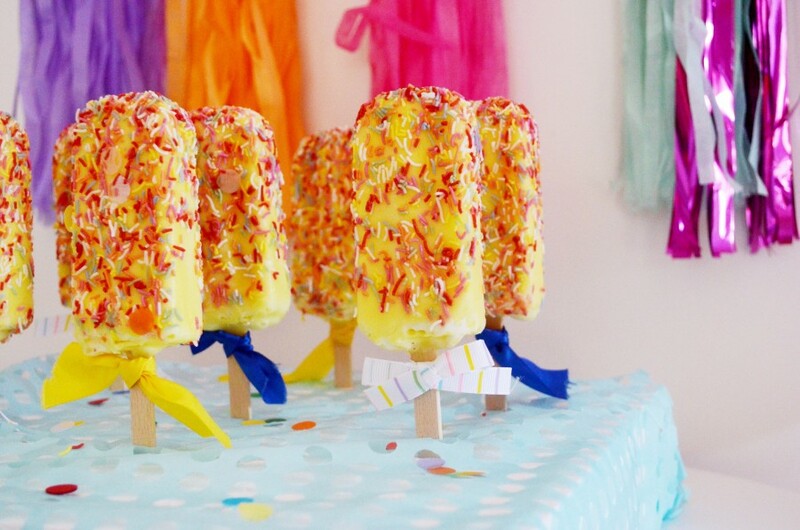 real dairy vanilla ice cream made with fresh milk and cream, dipped in creamy white chocolate and smothered in sprinkles. And quite strangely they taste just like fairy bread ? These were an easy snack to prepare, I had these unwrapped, tied some pretty ribbon on them and placed them in a foam box. 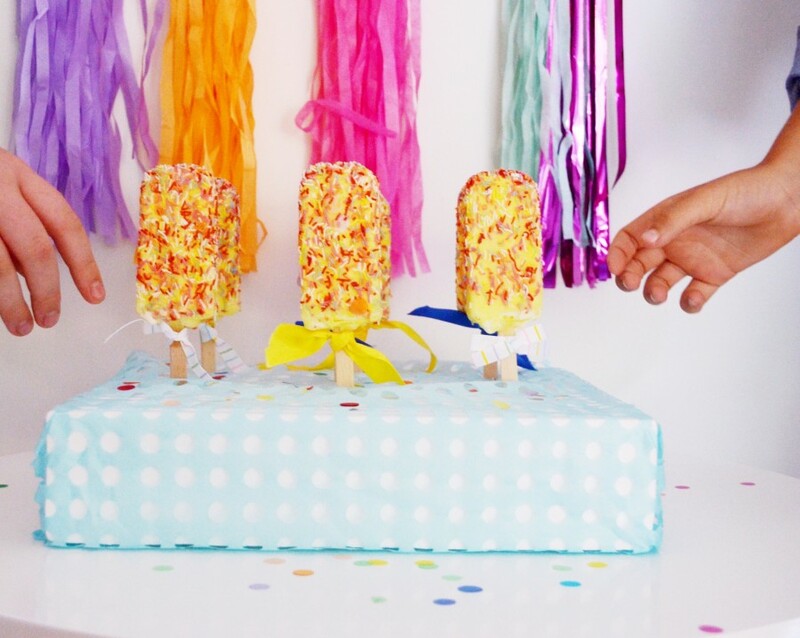 This gave the little hands easy access and they were a huge hit! They were finger licking good!! 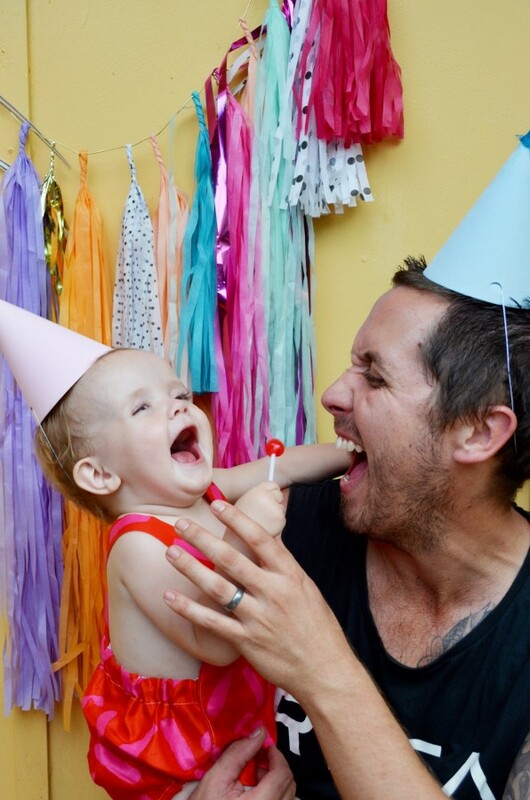 Our house was filled to the brim, sprinkled with birthday love for our sweet little girl. 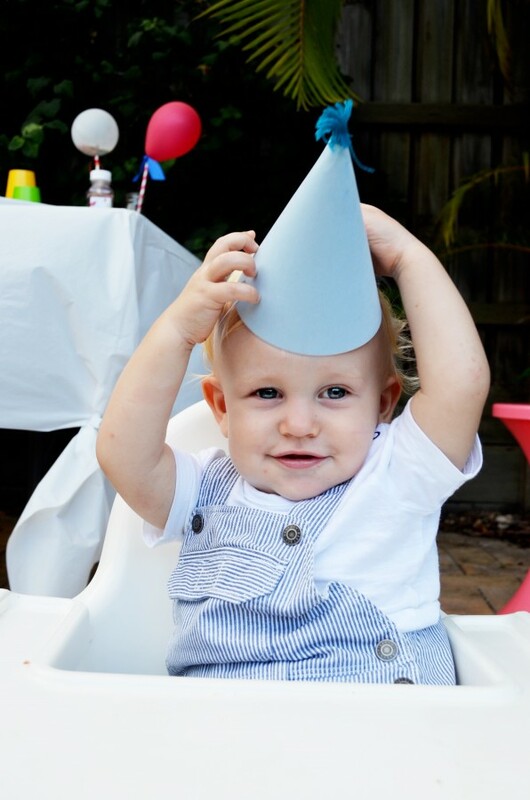 The whole day was kind of a dream, and I still can’t believe our baby is a year old. I wanted to make this a special birthday for her (even if she won’t remember it) and am so glad with how everything turned out. 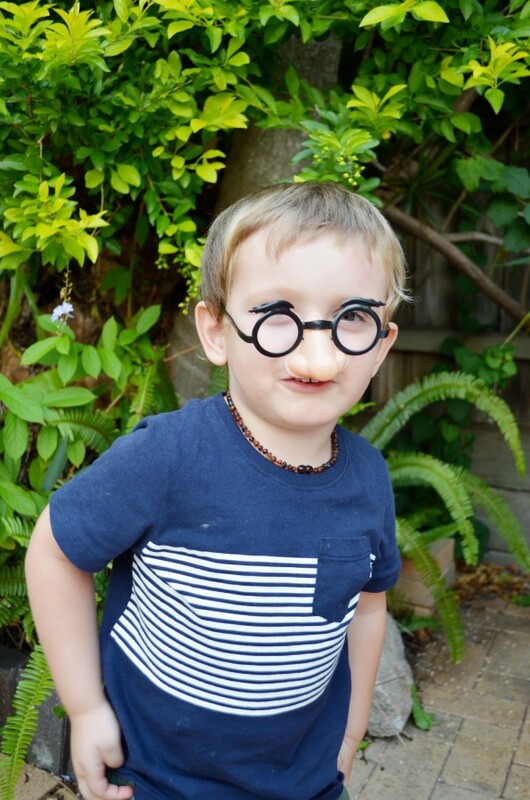 I am especially grateful to my darling niece, Demi who’s photos make up this blog post. 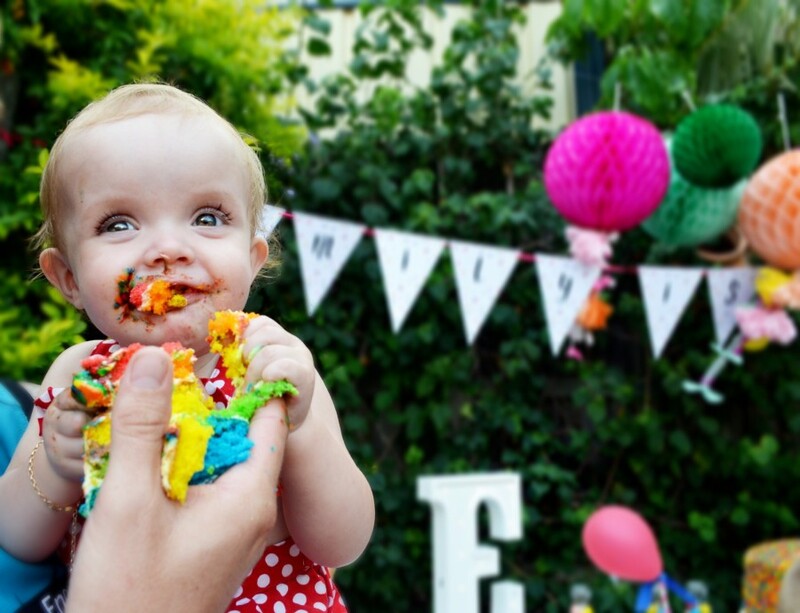 See, I had a lot of regret following Luella’s first birthday party that I had not asked someone to take photographs. I thought I could do it myself and ended up with only a handful of images. Lesson learned! Demi captured some priceless moments for us, and I cannot thank her enough! My mind was in that crazy hosting-coordinating-wrangling mode and it all went by too fast for me to be certain I was even there. 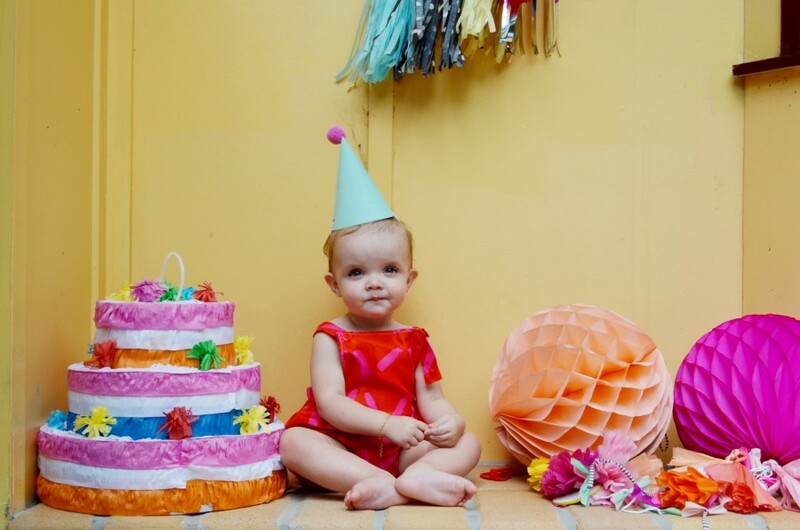 But best I can recall it was a perfect and lovely first birthday. Now I have the pictures to prove it. 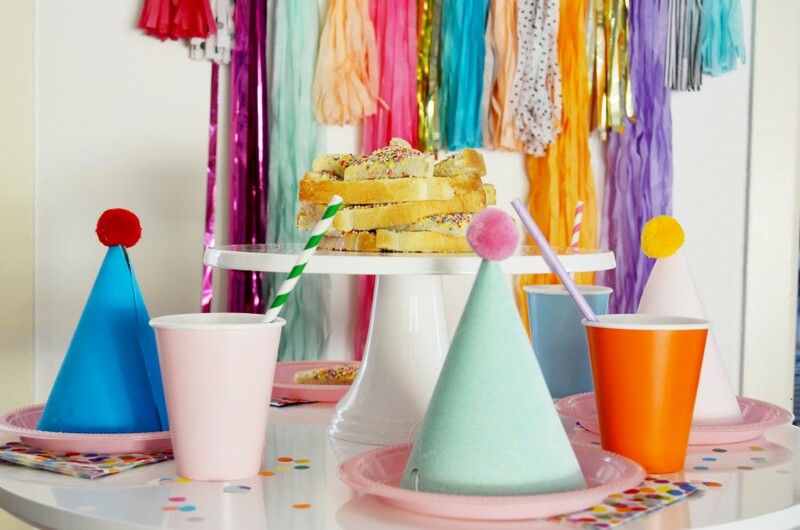 The idea for the invitation was the inspiration of the party. It was the first thing we created and set the tone and colours for the rest of the details. Emily LOVES colour. 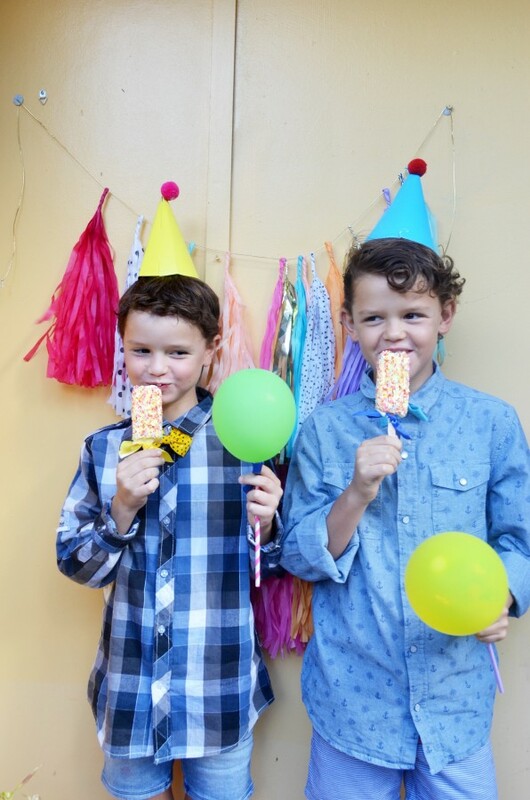 So we thought all the colours that comes with nature’s sprinkles – fruit, sprinkles and fairy bread! 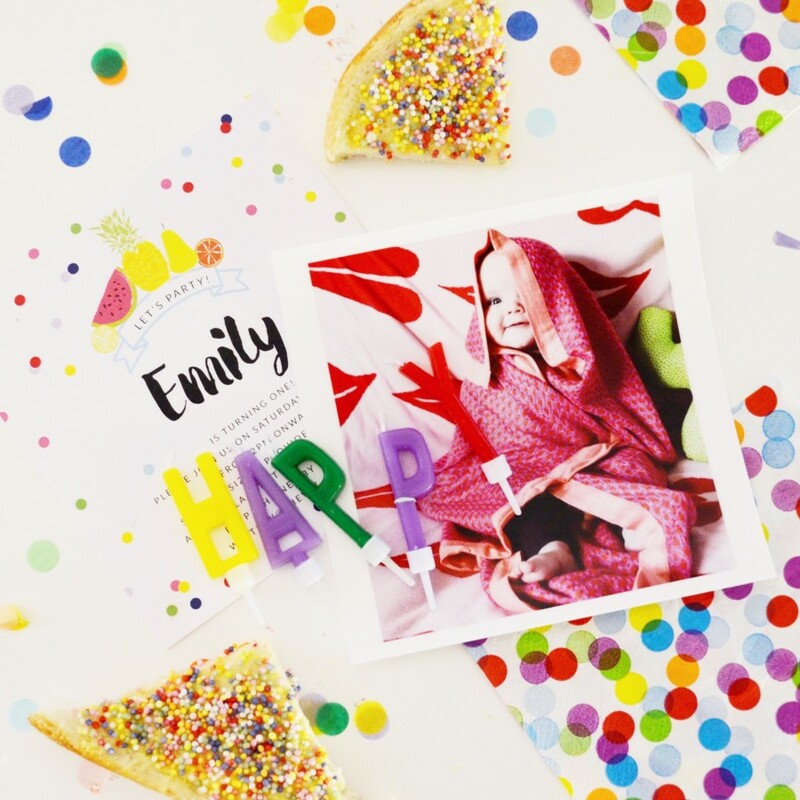 Invitations, ‘Emily is one’ bunting and water bottles were designed/printed by LovejkAustralia. 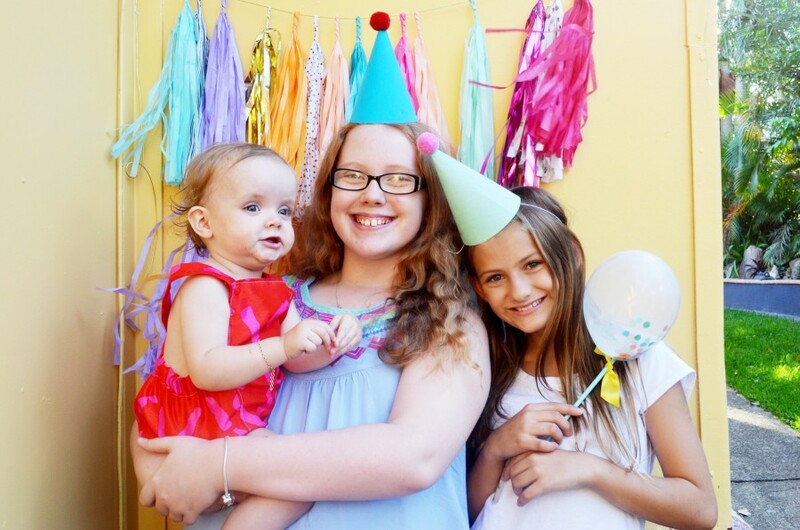 The super cute velvety Pom Pom party hats were from Poppies for Grace. We also gathered their amazing honey comb balls (these were to replace balloons, a real time saver too! 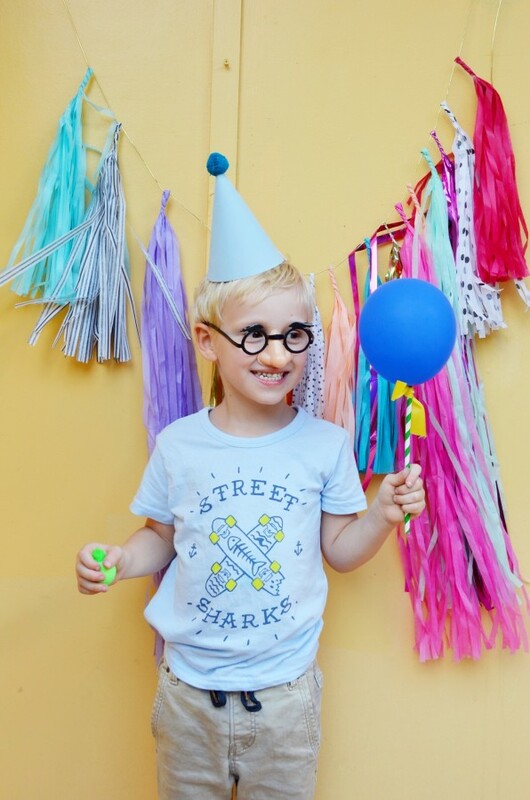 ), confetti party bags, colourful cups, confetti, straws, mini balloons, we also had an amazing jumbo ballon with tassels but unfortunately it didn’t make it into the photos. 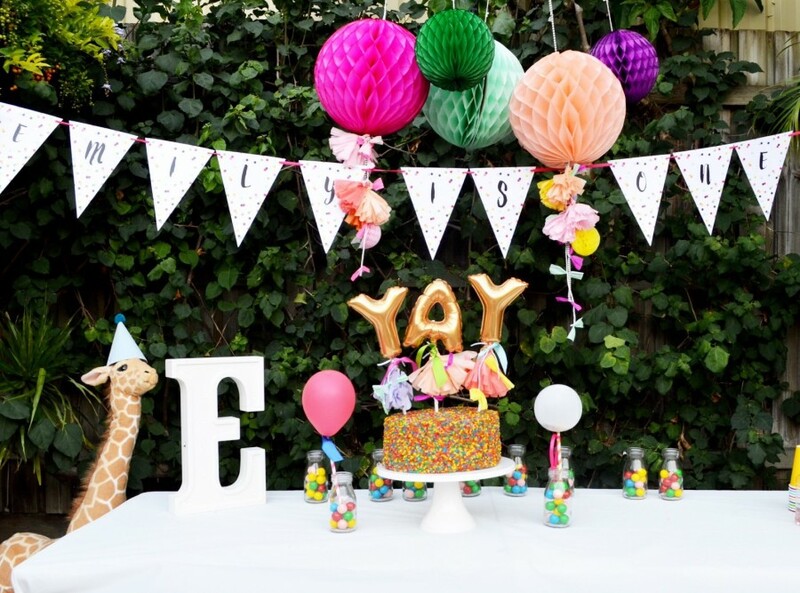 Rainbow tassel garland from DD brand. Most importantly, Emily and Luella’s outfits from Talking Red. I wouldn’t have been able to get the inspiration alive if it wasn’t for Instagram, Pinterest and Etsy. It’s a recurring theme for this party! Seeing this table I had in mind didn’t quite come to life due to being in that crazy hosting-coordinating-wrangling mode but it made me happy. 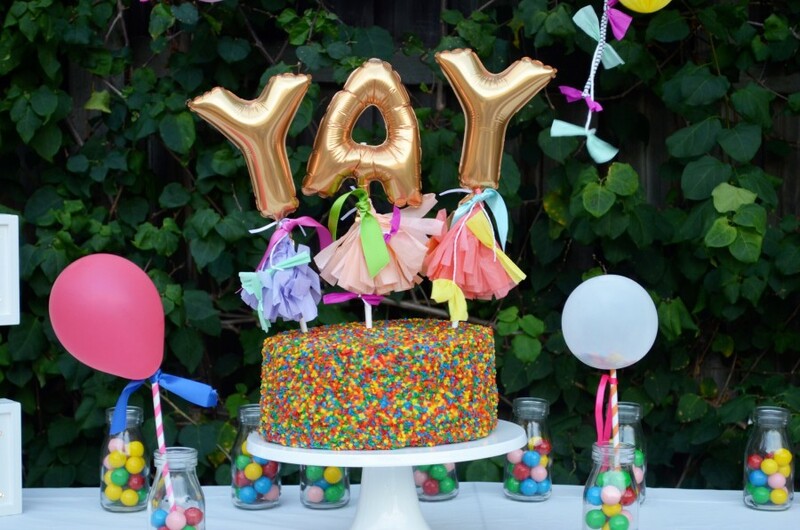 The colours, the layout, the cake, the teeny tiny details… most of all Emily “ooh”ed and “ahhh”ed over it and that’s what mattered to me the most. 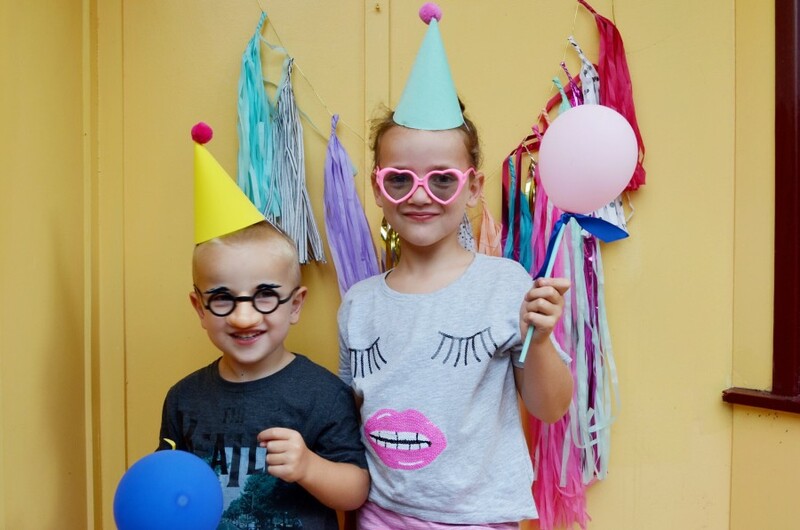 When thought setting up a little photo both with some silly fun props was a good idea. I chuckled on the day, Yeah right. 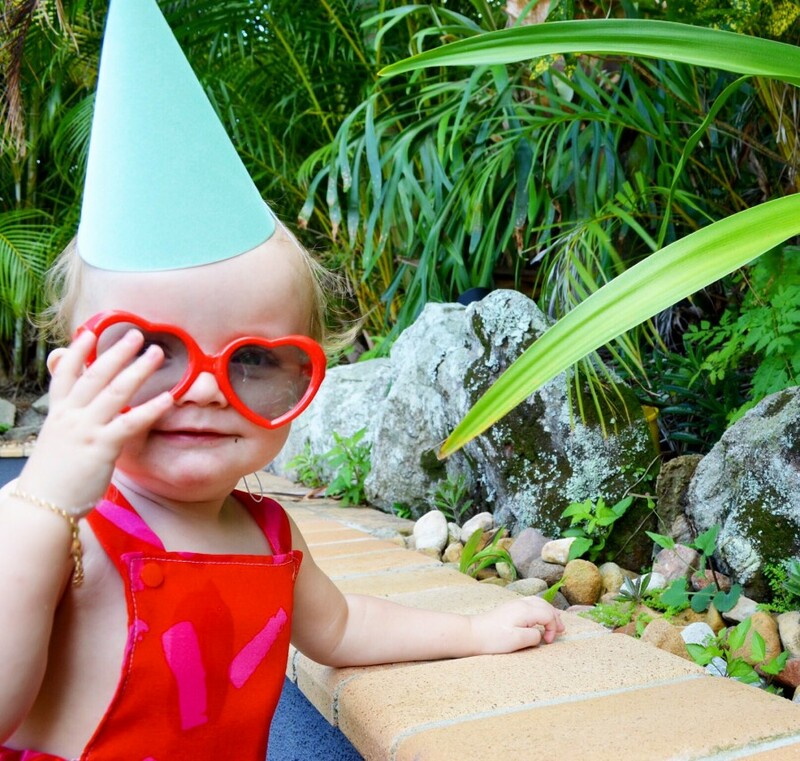 There were babies ranging in age from one to 19 months and some others under the age of seven. But then we did it anyways, and I love it. It was kind of a given that it would be chaotic, but these are the kind of photos that will be so fun to look back on in a few years. It is these kids and their parents (and of course our other friends and family!) 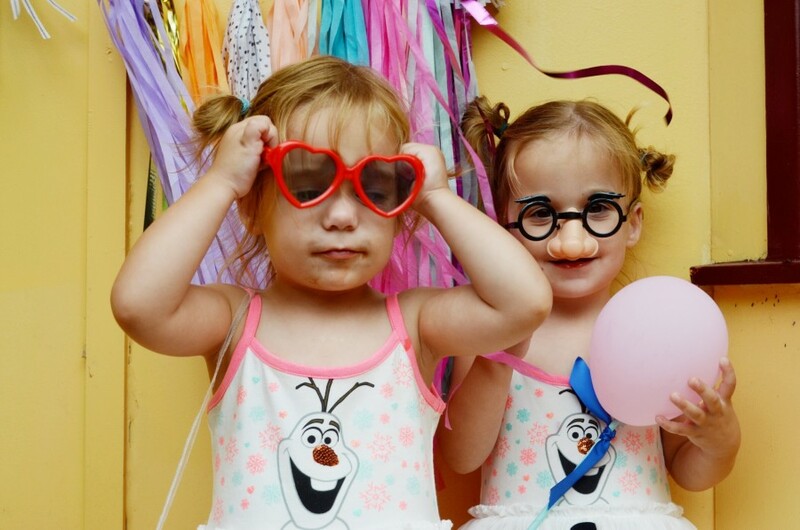 who made Emily’s first birthday party so very special. I am forever thankful to have them all bottled up together. Happy Birthday Emily. We think the world of you and may your little life be sprinkled with happiness.